TO: CG, NINTH AIR FORCE, APO 696, US ARMY (ATTENTION: 26TH SCU). CG, XIX TACTICAL AIR COMMAND, APO 141, US ARMY (ATTENTION: STAT CONTL SEC). CG, 303RD FIGHTER WING, APO 141, US ARMY (ATTENTION: STAT CONTL O). FROM: HQ 373RD FIGHTER BOMBER GROUP, APO 141, US ARMY, 6 JUNE 1944. 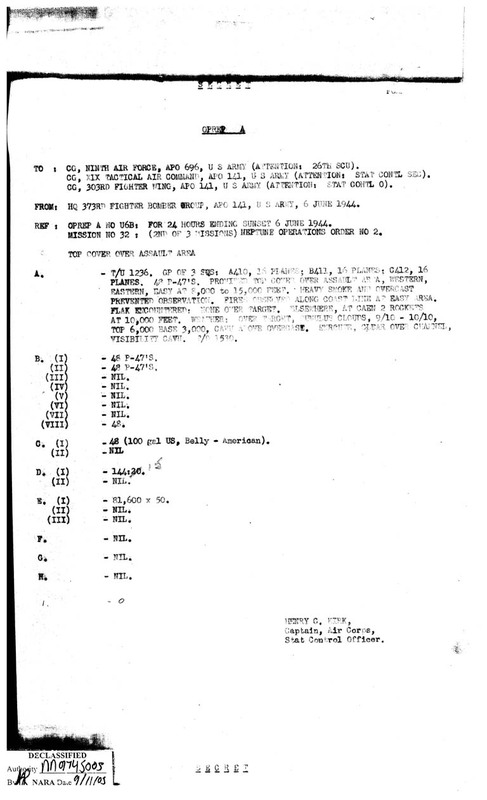 REF: OPERP A NO U6B: FOR 24 HOURS ENDING SUNSET 6 JUNE 1944. MISSION NO 32: (2ND OF 3 MISSIONS) NEPTUNE OPERATIONS ORDER NO 2. PREVENTED OBSERVATION. FIRES OBSERVED ALONG COAST LINE AT EASY AREA. B. (I) - 48 P-47’s. C. (I) - 48 (100 gal US, Belly - American). E. (I) - 81,600 x 50.